Now CLIA Waived! K Number in CLIA Database is K112101. Remove the test device from the sealed pouch and use it as soon as possible. Take the test at the assigned handle and hold the absorbent wick into the urine stream for 10-15 seconds. Not Pregnant: Only one colored line appears in the square window. This line is just the control line (C). Pregnant: Two red colored lines are visible; one line in the round test window (T) Test region, and a second line in the square window (C) Control region. The color intensity of the test line may be weaker or stronger than that of the control line. INVALID: No line appears in the control region (C). Under no circumstances should a positive sample be identified until the control line forms. hCG (Human chorionic gonadotropin)is a glycopeptide hormone produced by the placenta during pregnancy. 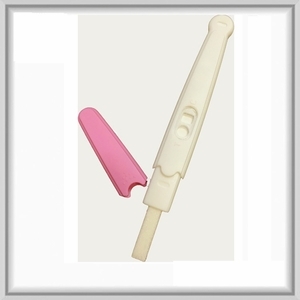 The appearance and rapid rise in the concentration of hCG in the woman��s urine makes it a good pregnancy marker. Usually, concentration of hCG in urine is at least 25 mIU/ml as early as seven to ten days after periof delays. The concentration increases steadily and reaches its maximum between the eighth and eleventh weeks of pregnancy.